Patience as we begin our first blogs! Today was our last work day, and what a day it was! I have only heard from Craig in Hue and he had to do a very complex surgery on a child, the likes of which I have never seen before. I will see him tomorrow and am eager to hear how it went. The nursing staff is exhausted, according to Lien, so they must be working very hard in Da Nang! A breakdown occurred in communication and Marcy may have had a day off. Lien left for England so our team is without the usual support as we prepare to leave. After 14 years, this is the first time we departed as a team alone! Walter’s illness is definitely better. He went to the doctor and has better meds than we had in our suitcases! He stayed in bed again today, but his fever is gone. This alone may allow him to fly home with us. The rules have changed and you supposedly can’t get on an airplane when ill.
At Gia Dinh Hospital, I had great day. We did three surgeries with 4 doctors getting to show what they’ve learned. I am thrilled. They all did very well showing a real grasp of what we have been trying to teach. In my parting speech, I told the hospital leadership that the young doctors were not only good surgeons, but were now prepared to teach sinus surgery. This is one of our goals. Mission accomplished! Tonight we go out together for traditional Vietnamese food. Many of you have asked about our "children" in Vietnam. Begee and I have hosted 10 fellowships in our home, and you will meet several of them here. Their children have become our grandchildren, of course! Here is Minh, our first fellow in 1997. She is the second from the left with her family. Tonight we were with Minh,s family. Our friendship is deep and we really love all of them. This is Binh, 4th from the right, and her entire family. Last night we went to Binh’s home. This was a very special event as two attending surgeons come to her home to be with her family. It was extremely rewarding for us, as well. Marcy joined Begee and I as Binh was in both of our homes last year in the States. This night was entirely social but seeds have already blossomed so this was an evening of encouragement! This is Male Minh but his family was sick on this evening. We still had a very special evening of encouragement! and here are three former fellows and the next fellow... Luong, Dinh, Dinh's wife Hang who will be coming in the Spring of 2010, and Phong. Hannah, I hope your class is still enjoying the blog. I haven't heard from any of you in a while. Today I was alone at Giu Dinh Hospital. I went there last year and found it a very progressive hospital with a young faculty and a great desire to learn. They have some equipment, which we contributed last year, but no powered instrumentation. I will try to find donations for them next year, if possible. The Vietnamese have asked me to come twice in 2010, and this will be a serious matter of prayer. I haven’t heard from the team members in Da Nang or Hue. Walter is not feeling well and stayed in bed this AM. He is doing better this evening. I don’t know the cause but we are constantly reminded that no matter how good some foods may look, we have to abide by the time honored tradition of no uncooked veggies, thin skinned fruits and NO ice. Kathie was down for 24 hours last week and she felt ice was the cause. Today is Kaleb’s birthday! 10 years old. Our first grandson! Love to you Kaleb and we pray your day is wonderful! Flat loves traditional Vietnames coffee, especially before surgery to calm his nerves. Unfortunately, he drank so much he almost became Unflat, AND, he had the shakes as VN coffee has lots of caffeine! Here is Flat reading the CT scan's of our sinus surgery patient. It was tough surgery and he had to be prepared! Here is Flat getting ready to operate. The patient is hidden under the sheets and Flat thought they looked a little alike! Maddie, here is one of our children, Male Minh! Here is Flat speaking with Uncle Ho. I don't think Flat had anything very deep to talk about; he was pretty shallow! Here is Flat attending my lecture to 40 doctors. He gave me an "A+!" Since his Mangosteen, he has been without a fever or cough! Here he is eating his Mangosteen. Loved it! He hasn't had any sinus problems since eating this! So much to say… what a great day! A day of the best of everything. Last night, Begee and I had dinner with a former fellow. The conversation was extraordinary… exactly what we wished to hear. The individual is extending influence to family, friends, colleagues and parents! PTL! On the way home we renewed our friendship with a tiny family store with great Ralp Loren golf shirts (not a spelling error but a quote from the lable) for $3.30 @! These, shirts are as good as the $76 look-a-like in the States, which have correct spelling! This morning was surgery and we did four cases. The highlight of any teacher’s professional life is seeing former students who have excelled in the subject taught to be better than the teacher. Minh (our first fellow in 1997) is an extraordinary sinus surgeon and performed an extremely difficult frontal sinus dissection, and it was the best I have ever seen in 22 years of doing/teaching/watching this new surgery. It was done in front of a closed-circuit audience of 40 ENT doctors. So exciting! The Marcy did a sinus case and I was again thrilled and proud! The afternoon was again lectures. Dr. Marcy Bothwell and I spoke. Marcy was a medical student and resident under me at the Univ of Missouri. She has blossomed into a wonderful surgeon, teacher and leader. We are blessed to have her on the team. Wonderful day and Begee continues to be healthy and happy. She spent an hour today, one on one, with Dr. Dung, one of the most dynamic leaders in our specialty in all of Asia. We are happy! I'm sorry, I forgot my camera today. No photos! I received a complaint from Madison Grace, our Granddaughter, that I have not included photos of our Vietnamese "children and grandchildren." She is right; you all are "related!" I will get better as the next three nights we will be with "family." Today, the entire southern team is at the ENT Hospital in HCMC. It is the most advanced facility in VN and I have to keep reminding myself that 14 years ago, nothing plugged-in in the OR, ICU, etc. They had never seen an endoscope or heard of FESSurgery. Now they are superb. We saw patients all morning and will begin a sinus course this afternoon with doctors from the city and provinces viewing lectures, then tomorrow watching surgery on closed-circuit. The teaching opportunities have extended way beyond the walls of the hospitals. What a blessing. We lecture again tomorrow afternoon, then I go to a different hospital while everyone else stays here. Medtronic equipment was distributed here today and is such a smashing success! What a blessing to have corporations that contribute so heavily to Third World medicine and health care! Our brothers and sisters at home are so loving! When we go to Mexico, I tell our participants to keep their eyes open, because they will definitely see miracles. We have not seen as many in Vietnam but today was miraculous! Let me tell you the story. Craig and I planned a wonderful morning of sailing in the Pacific. But last night, Craig received a late night call that a friend of Lien’s was ill. Craig arranged care and gave medicines. This morning, there was no wind and the ocean was quiet. Bummer, no sailing! “Let’s go have a great breakfast!” There was Craig’s patient. We ate with him and soon, his friend came by and we had a great conversation. There was the exchange of business cards, and his said, “Director General, Vietnam International Education Development, Ministry of Education and Training.” This man was extremely knowledable about REI (our organization) and helpful since its inception. He was the President of Hanoi University. But now he is in charge of nursing education and is very desirous of finding ways to improve nursing in VN. Our goal is identical! We called Elaine and Aja (our professors of nursing) and they came for an hour’s exchange of how we could jointly accomplish our very similar goals. Alleluia! No wind! A weekend retreat away from the pressures of teaching surgery, lecturing, hosting, listening intently to poor English... and we did it in Da Nang at Furama Resort. Above is my dear friend, Craig Hedges from Sioux Falls, SD. We've done annual trips together in VN since '98 and Cuba since '2000. Here we are on a 5-star, PGA approved, Colin Montgomery golf course having the golfing nuts golfing outing of a lifetime. Here are our caddies (required)! On the left of the picture is the Pacific Ocean and on the right is a bunker from the "American War!" Our hotel is lovely. Begee is viewing the Pacific. This is a weekend for us to treasure. In the not to distant future, we won't be able to afford these accommodations, but for now, it a vacationers dream and very inexpensive. Tomorrow half the team flies to HCMC and Craig goes to Hue and the nurses work here in Da Nang. Craig is thrilled because he gets to give phenomenal donations to the University Hospital. The ENT Dept is unbelievably poor with NO modern equipment at all. Medtronic and Karl Storz have contributed heavily with surgical equipment for modern sinus surgery and airway surgery. He will train the doctors all week giving them their first opportunity to do endoscopic work. Today is the anniversary of a day most of us will never forget. 9/11, Begee and I were in HCMC preparing for bed. 9PM here and a tearful colleague called telling us to turn on TV. We witnessed the second building being hit. Vietnam will always be marked with that memory. It is fun that our Granddaughter, Hannah's 6th grade class is viewing the blog. Hello everyone!!!!!! We are safe and having a wonderful time! No photos today as it is bedtime and we don't have a very good internet availability. We said a huge number of good-byes today then caught the plane south. Da Nang is fascinating in that little has changed since the "American War." The revetments are still lining the taxiways, and there are fighters lined up, but they appear to be Migs. We checked into Furama, then went for a swim in the Pacific. We are on China Beach across from Monkey Mountain. Tonight Begee and I had dinner with our former fellows' families (so these are our children and grandchildren of the Far East!). These are extremely special moments with conversations based on their 3 months experience in our home. We can only pray for growth! It is Thurs eve and we are so excited as each day the relationships continue to ripen and the discussions deepen. Each team member is reporting joy and excitement. Nothing unpleasant is occurring! The Haiphong experience was extremely good and everyone returned with a very upbeat attitude, feeling it is a real possibility for the future. Begee is doing extremely well and is very happy. If she has any down side, it is that she shopped till she dropped today! When I arrived back, she was full of fun stories with renewed friendships in the market. "I see you nex year!" I had a wonderful day starting with the presentation of the Gold Laser to the Director of Bach Mai. Then we did three surgeries and I gave a very productive lecture. The patient's families always give me a huge bouquet of gorgeous flowers, so each day I come home with three of these giant floral arrangements. The room is filled, the hotel lobby is filled, I even gave one to a complete stranger from Australia! The good-byes are lovely. The nursing staff and teaching faculty so deeply appreciate what we are doing. At the farewell moment, there is always a good moment to say why we are really here! Tomorrow it is off to Da Nang! My OR colleagues will appreciate that the largest hospital in VN is quite lacking when it comes to cautery grounding pads! Luong, Lien (our heaven sent REI leader! ), the Director, me and Dinh after the Gold Laser presentation to the hospital. Here is Dr. Luong mastering the art of being a Gold Laser surgeon. These photos are out of order, but here I am teaching some of the staff the techniques of Gold Laser surgery. The little girl below is much more interesting!!!! Today was a very special day as we were able to donate the Gold Laser to Bach Mai Hospital. I don't think I am allowed to tell you the amount of the gift but it is 6 digits and is the first ever Gold Laser in Asia. MedEnergy out of New Orleans contributed this state of the art equipment and the little 6 yearold girl above was the first patient. She had her tonsils and adenoid removed and she was a great patient! We spent the morning teaching about the laser, then did two cases. The second was the worst sinus case imaginable. I never see them this bad in the USA. Gross! We went to dinner tonight with one of dearest friends and former fellows, Quang and his wife. How things have changed. ALL the doctors used to be so poor. We were his guests at a lovely restaurant near where he grew up (near the heart of our bombing in the early '70's). He is now the boss and drove us in his Mercedes. This points up the need for us to move on. He and I discussed the need to move our teaching to the more rural medical teaching centers, such as Haiphong. I have not seen the rest of the team since their return, but Quang told me their experience was extremely good. We will need to discuss this with Brian Teel, Cliff, Chuck and the other REI team doctors. Guys! We need to talk and plan about the future! Medically, everyone is reporting wonderful experiences. The medical arms of our goals are being met and we feel we are being very effective. In our relationship building, I don't know how anything could be better. Conversations are deep and meaningful. Tonight we all went to a small dinner party with the leadership of the National ENT Hospital. Begee and I feel honored as the Director and one of the Vice-Directors were our fellows, Quang and Can. We are having intimate time with both during this week. Marcy and I lectured today at the National Hospital and the audience was very large and very responsive. The surgeries went very well for both of us. Craig reports the same. Elaine and Kathie are part of the nursing team. They are breaking ground with the different hospitals in Hanoi. Here they are meeting with one of the nurse leaders here in Hanoi. 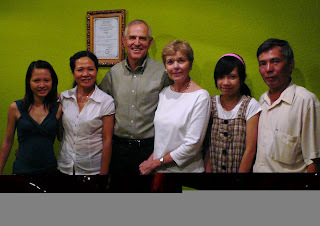 The entire team except Begee and I will go to Haiphong tomorrow to break ground for a new effort there. Craig is leading the team and we will learn a lot from this visit. Below that is a photo of Dr. Marcy Bothwell with Uncle Ho. We never give a lecture anywhere without his presence! Begee is feeling fine except for the heat. 90+ temp and humidity. The jet lag has been almost non-existant. We are blessed. tomorrow is a big day but I will save my report. The typical morning start... meeting in the Directors office, introductions, discussion of plans and goals, presentions of donations, etc. Quang is the Director of the National ENT Hospital in Hanoi (far end of table, & our fellow several years ago). The reason we come to Vietnam is to development meaningful relationships with the Vietnamese doctors and their families. This is Dr. Lien, the editor of the Vietnamese ENT Journal. He has been a friend for 14 years. I know our friendship is very dear to him. But the most important friendships are the ones we cultivate in the evenings. This is Dr. Phong and his wife and daughter. He was Craig's fellow and knows and understands why we come to Vietnam! Everyone except Craig was at the National ENT Hospital today. I haven't seen anyone yet so no feedback, but my day went fine! I did 2 sinus surgeries and it is interesting because we are now on our 2nd generation of students... our first students are now the leaders and these are their students who have become the teaching staff! Every night this week we will be taking out our former fellows, except Tues. when there is a big banquet. I said a huge # of hello's today and the friendships are so deep and trusting. Returning is a wonderful blessing. Jet lag not too bad, but we are busy! More later. Thank you for your prayers. 9 of the 11 have arrived safely and the other 2 arrive on Thursday. No one had any unfortunate experiences with travel. Today is Sunday and we slept late as there is no church that we know of that we are able to attend. Begee is feeling reasonably well with just a tiny bit more fatique than the rest of us are experiencing. She is blaming it on the heat, which is a problem. The Vietnamese food is great, the streets and shops are fun, Sword Lake (Hoan Kiem) is as fascinating as always and we are very affectionately remembered by our friends (many of whom Begee and I regard as our children) and the hotel staff (who remembered us by name as we walked in!). Lien and Long are on top of everything, as always! Of the 9, all are vets from prior trips except Marcy Bothwell. Marcy was a medical student and ENT resident with us at Missouri and later did her Peds ENT fellowship with Rod Lusk in St. Louis. She has helped us with other Vietnamese Fellows in the past, so she is not a complete stranger. For the other team members, go to www.parsonsministries.org, home page. This is a photo of a typical lecture given last year in Hanoi. Click on the photo and it will enlarge! As we begin this trip, my goal is to have a new level of communication with you by having more photos. Vietnam is such a richly beautiful country with amazingly resilient people. Our hope is that you will be touched by what you read, and be our constant prayer warriors. 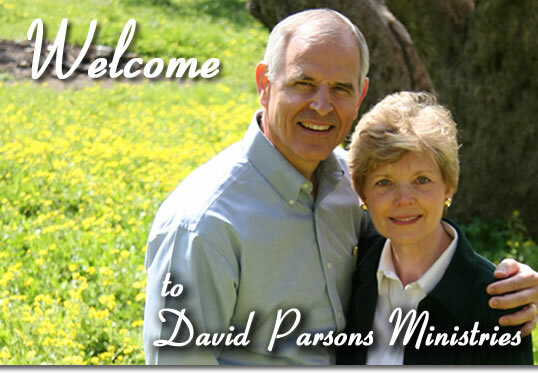 I will try to get photos of the team for you to go along with what is on http://www.parsonsministries.org/ homepage.